The ECA compiled this series of articles to clarify some misconceptions in the field, and to ensure that our members are better equipped to do their work, particularly when issuing CoCs. The Occupational Health and Safety Act, No 85 of 1993 (OHS Act). 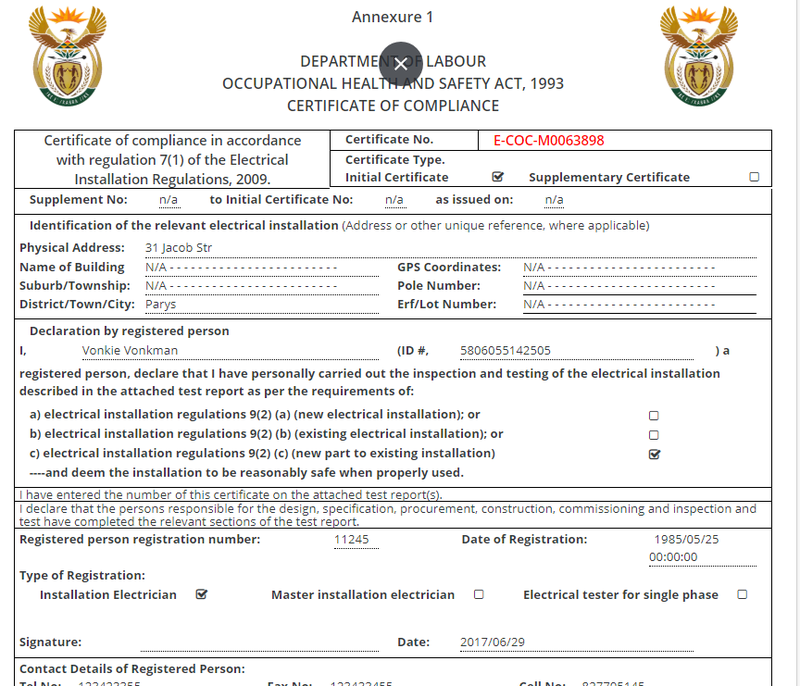 The Electrical Installation Regulations of 2009 (EIR). 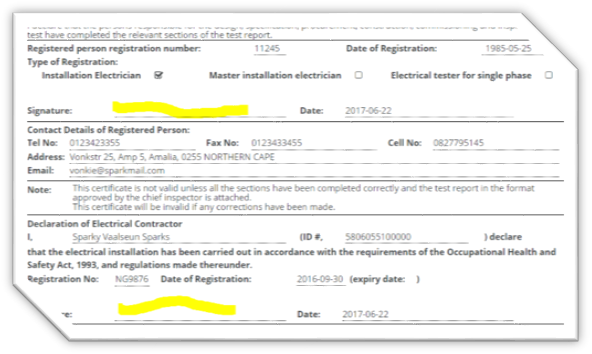 All these documents are available in the public domain, the first two from our website http://ecasa.co.za at no cost to our members, and the other directly from the SABS or via our offices. 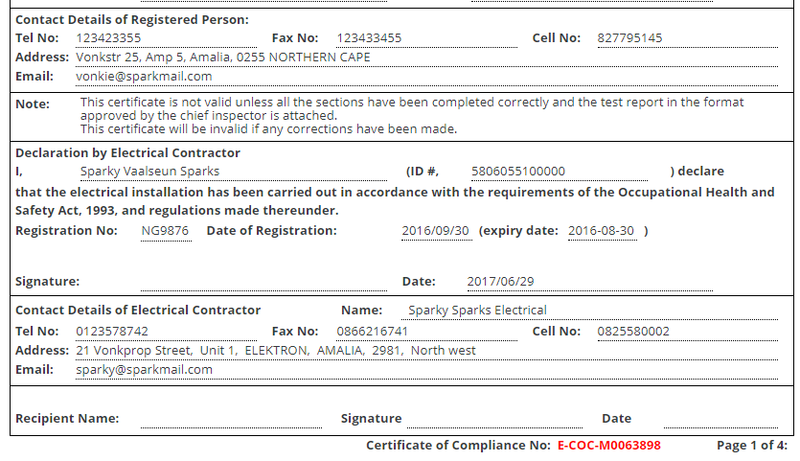 The ECA(SA) has developed an electronic Certificate of Compliance (e-CoC) to meet the needs of the electrical contracting industry in South Africa. The e-CoC makes easy the tasks of completing, storing and retrieving CoCs. 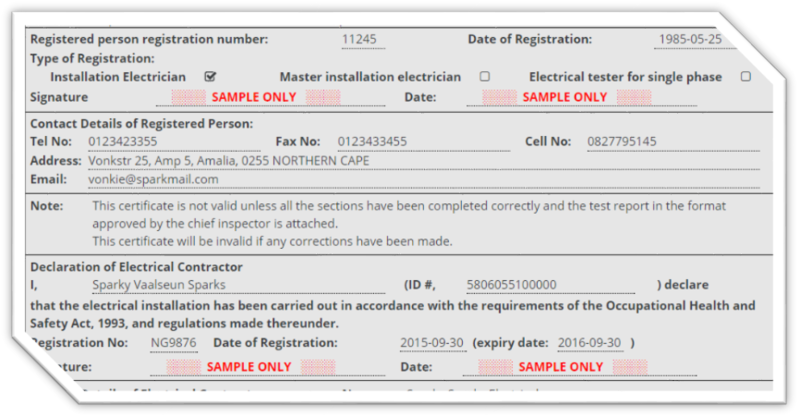 To make going digital even easier, the ECA(SA) provides members with five free samples for testing purposes. For your free samples, contact your closest regional office or email it@ecasa.co.za. The ECA(SA)’s IT department provides support for users of the electronic CoC (e-CoC) and answers users’ questions such as how to purchase e-CoCs and access the e-CoC platform; and also helps end-users should information not display correctly. All queries sent to IT support are usually resolved the same day. In this tutorial, Cecil Lancaster, the Regional Director of the Bosveld region, demonstrates the e-CoC’s functionality, where to insert information and how to complete the document in about five minutes. His easy-to-follow tutorial shows that the e-CoC is as easy as 1-2-3.
select a current e-CoC you would like to continue with. 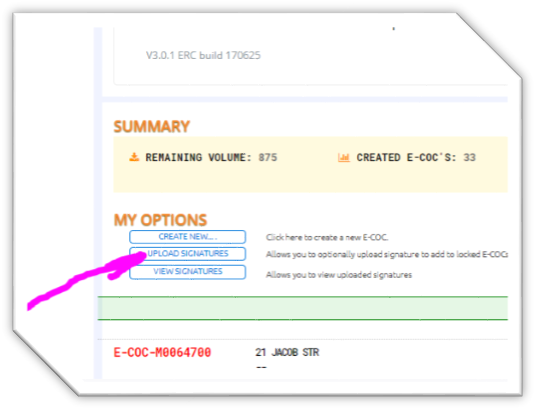 To start a new e-CoC, click on the ‘Create New’ button, and you will be requested to insert the street address and town name, then tick to accept the conditions, and ‘continue’. 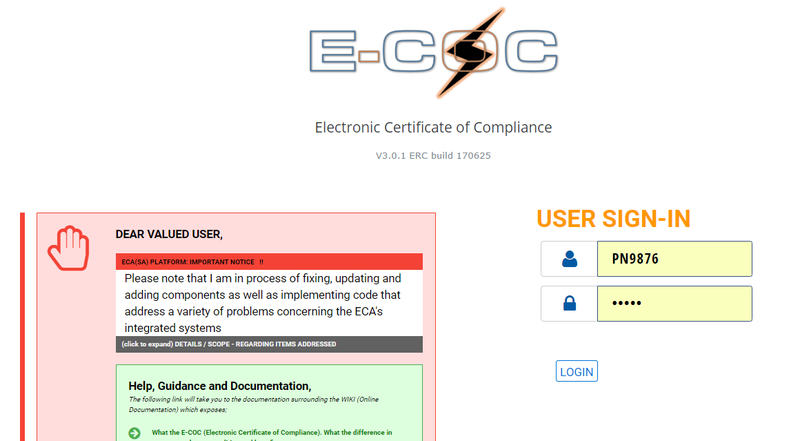 To continue working on a current e-CoC, select the e-CoC and the page on which you want to work. Note: If at any time you need to interrupt the process, you can save your work and resume whenever you wish by simply logging on again. 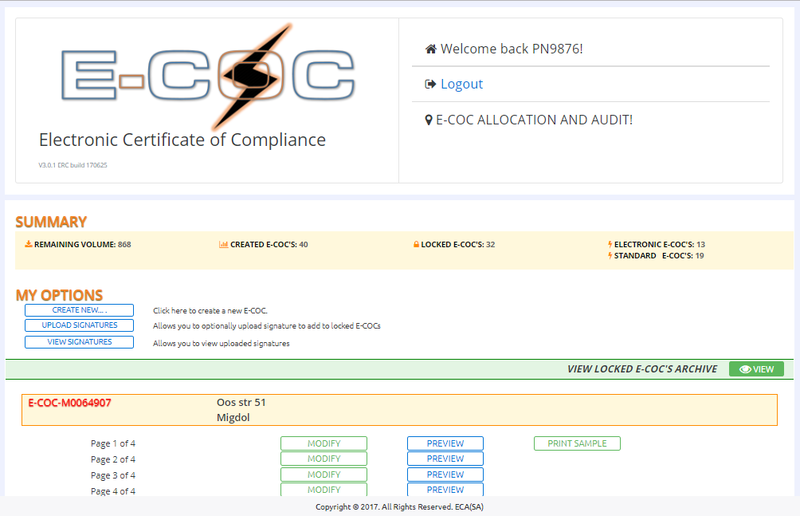 You can even log on from another device such as a tablet or mobile phone the next time you wish to continue working on the e-CoC. Select ‘Initial’ or ‘Supplementary’; if ‘Supplementary’, add the required information on the same line. 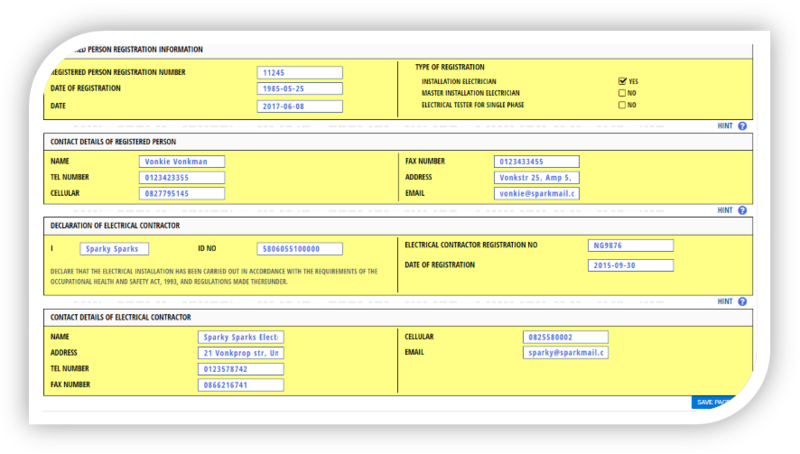 The basic address is inserted for you, but you can add additional information such as building name, suburb, pole number, etc. 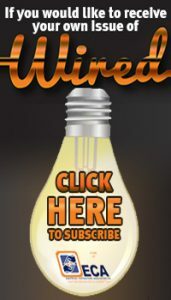 The address and town name that you inserted previously cannot be changed, and this is shown on a greyed-out background. Select a); b); or c): New/Existing/Addition. Check that the rest of the information we’ve inserted for you is correct. If the information is incorrect, it is because your data on the ECA’s database has not been updated. 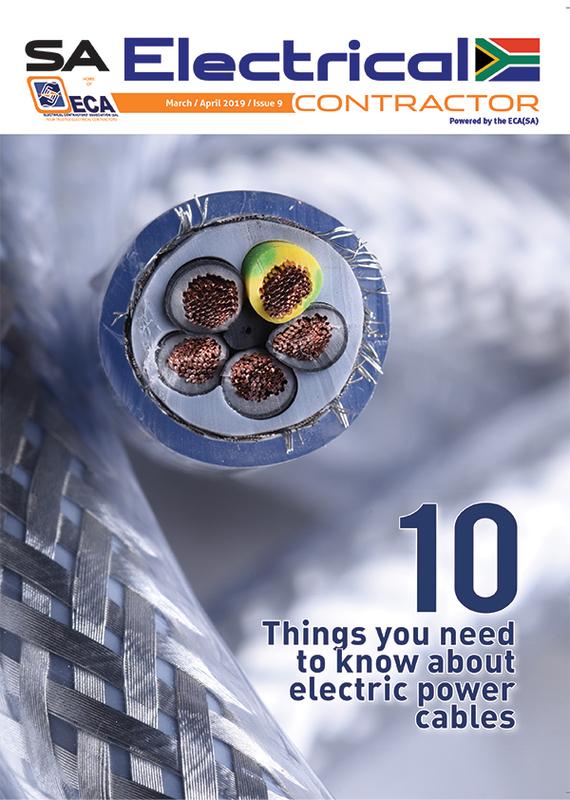 To check, go to the ECA website http://ecasa.co.za and select ‘Registered Member Login’. Guidelines on updating your information is provided at the end of this article. Select ‘SAVE PAGE DATA’ at the bottom of the page; and Page 1 is done. Page 4 comes completed with your information and the unused spaces crossed out. You only need to tick a box to select ‘New’ or ‘Existing’. 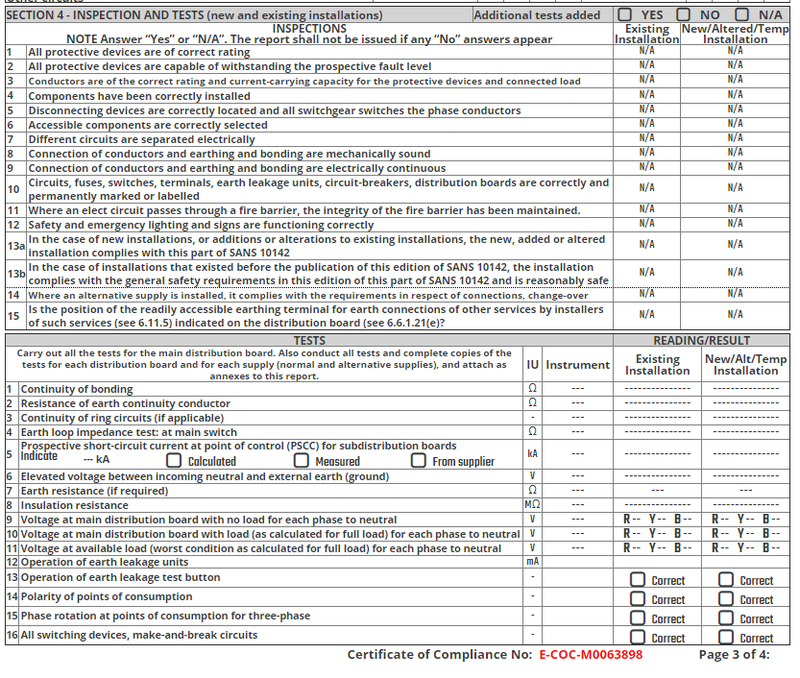 Select ‘SAVE PAGE DATA’ and that’s two pages done … unless you need to complete 5.1-3 for design, procurement and construction, or 5.5 for five or more units. If you need to complete the above, simply edit the page and then save. 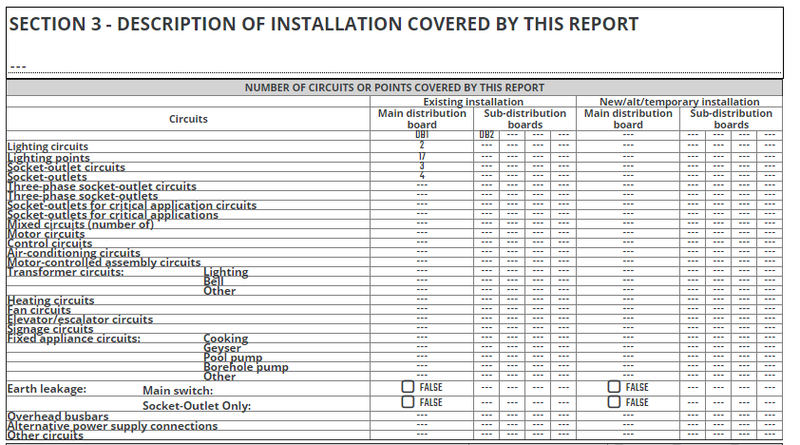 Page two requires that some items are inserted, such as the date of issue, PSCC, current rating, short circuit withstand rating and also requires that the correct boxes are ticked; most are pre-selected, but this needs to be confirmed. Page three must be completed in full, however, all unused spaces are automatically cancelled, and values can be typed in or selected with the up/down buttons. 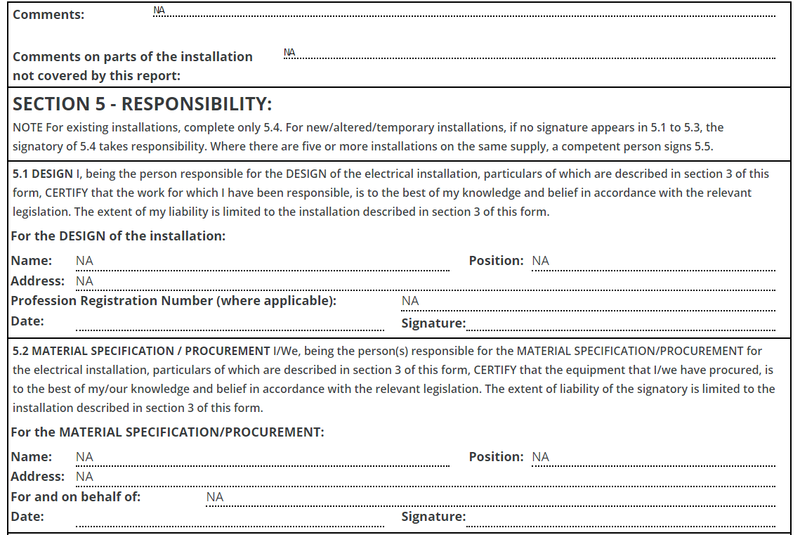 Inspection items are all defaulted to ‘No’, to ensure your consideration and confirmation. The test results are recorded in the same manner. Complete these, then ‘SAVE PAGE DATA’, and you are done. 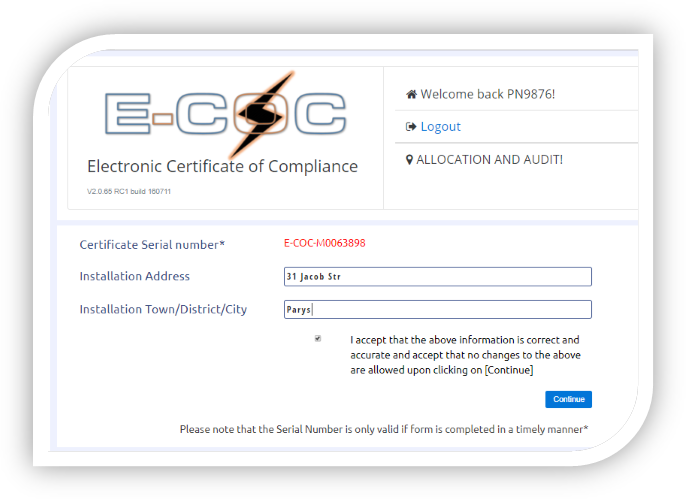 For a basic e-CoC without additional sheets or attachments, you only need to save the e-CoC, attach the signatures and outstanding dates, print and issue it to your client. 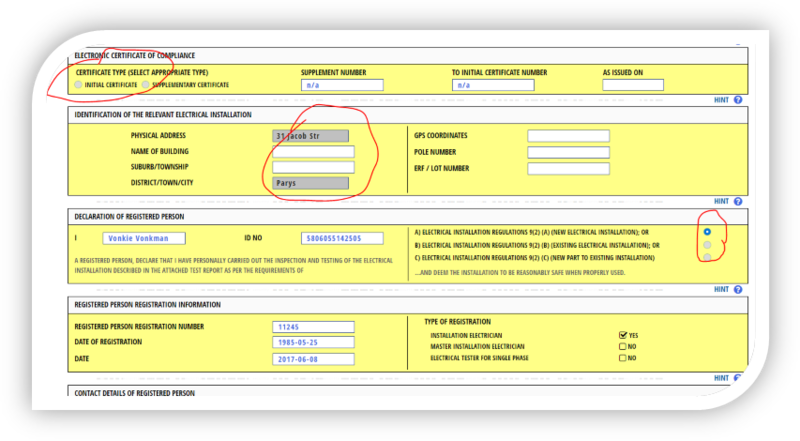 Additional test sheets and/or attachments for more complex CoCs select the ‘+ADD ADDITIONAL TEST REPORT’ button as indicated below. If you are not adding documents, skip forward to *** below. … and type in the name you want to allocate to it and click on ‘Continue’. Repeat for each item, selecting the relevant one from the list as you wish to complete it, then complete, view and save as per the main pages. 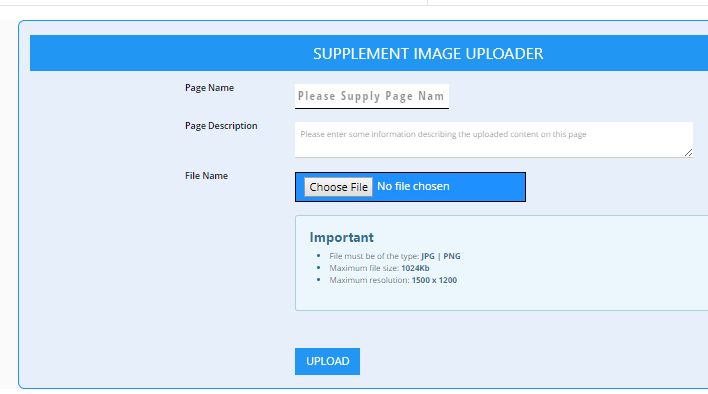 To attach photographs, sketches, copies of quotations and any other documents, you need to select ‘+ADD ADDITIONAL IMAGES’. You will be taken to the ‘Upload’ page. Here you enter the name you wish to allocate to the document, a concise description in the ‘Page Description’ area and then select the file from your storage under ‘Choose File’. Please note that your files have to comply with the parameters set out under ‘Important’ otherwise they will not load. We recommend that you prepare these files beforehand and save them in the correct format and size in a dedicated folder on your computer. Repeat for each item until all attachments are loaded. *** Once you have completed all items, the time has come to finally and permanently ‘LOCK E-CoC. To lock and finalise the e-CoC, we recommend that you first select ‘PRINT SAMPLE’ and scrutinise the document for correctness. 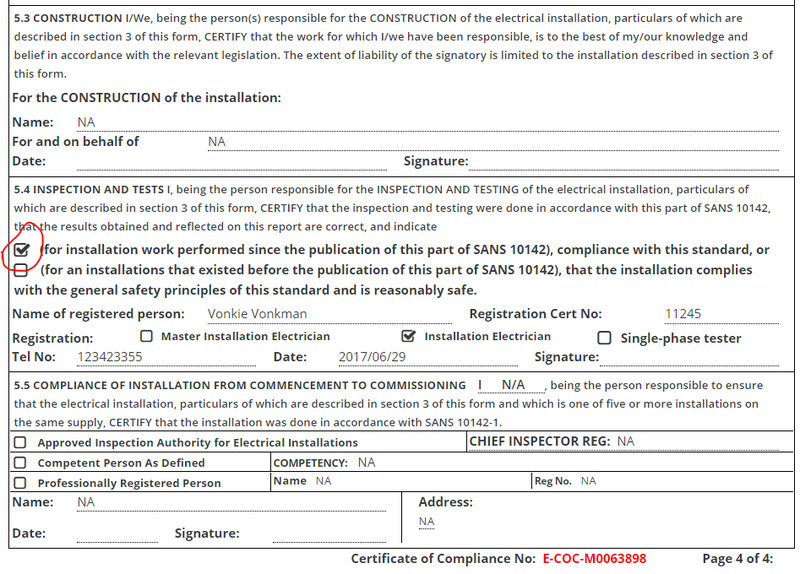 It will now appear as follows, with notes added to indicate that the e-CoC is not yet valid for issue. This will help with the printing of an office copy draft for checking/proof-reading prior to locking and, hopefully, satisfy Eskom and some local councils’ requirements for a ‘Dry CoC’ prior to switching on. Once you are sure, press ‘LOCK E-COC’ at the bottom. Note: This is irreversible and, if defects in the e-CoC are found later, you will have to abandon this e-CoC and re-do the whole document. Repeat for each item, selecting the relevant one from the list as you wish to complete it; then complete, view and save as per the main pages. 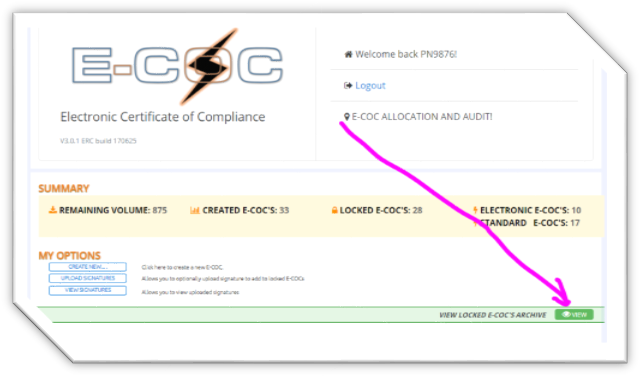 Once you have selected the ‘LOCK E-CoC’ button, you will be taken back to the ‘Welcome page’, from where you need to select the ‘VIEW’ button. 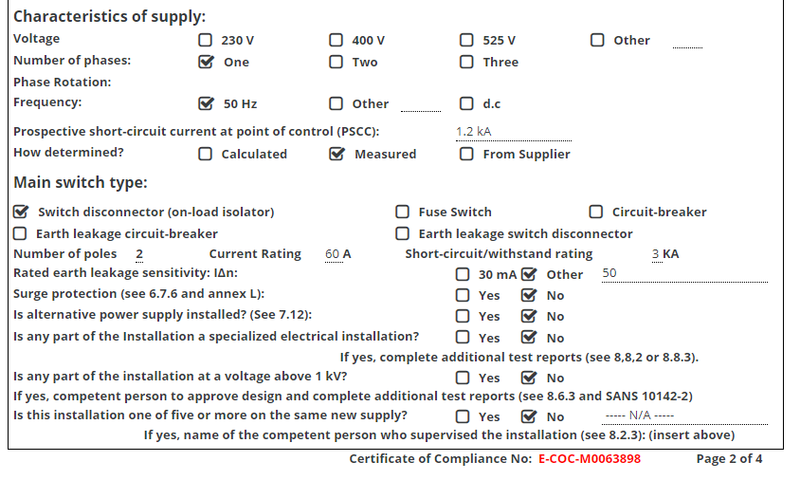 Then select the down arrow next to ‘STANDARD’ under ‘E-COC TYPE’ and, from there, select ‘STANDARD’ or ‘ELECTRONIC’. 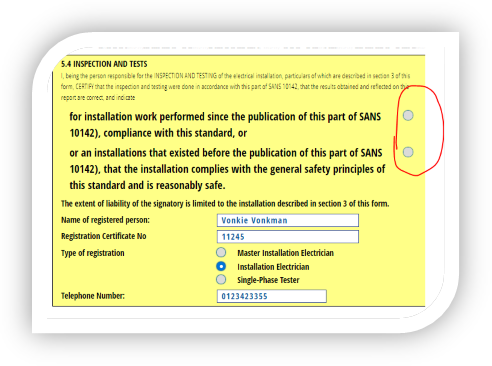 If you select ‘STANDARD’, the document will save as is and without signatures when you click on ‘SAVE’ and you can then print out and manually sign the e-CoC where the yellow highlights (below) indicate. If you prefer electronic signing, select ‘ELECTRONIC’ and ‘SAVE’ and you will go back to here and will now have to attach signatures. If you have previously uploaded a signature, you click on the upper ‘Select signature’ and select your signature (you can upload a few versions and select the one you prefer at the time, every time) from the list, then press ‘SET’ to display the signature. If you are satisfied, click on ‘LOCK’ below the signature, and it is locked forever. Should you change your mind, press the lower ‘Select Signature’ to change the signature. And follow the instructions. You may need to scan your signature and save it in the prescribed format on your PC and then load it from there. Some clients may insist on having e-CoCs printed on yellow paper and, in these instances, you can simply purchase yellow A4 paper from a stationery shop and print the e-CoC on yellow-coloured paper. Future developments of the electronic CoC will include the verification of values to ensure that the values are correct and will be referred to as a ‘SMART’ e-CoC. 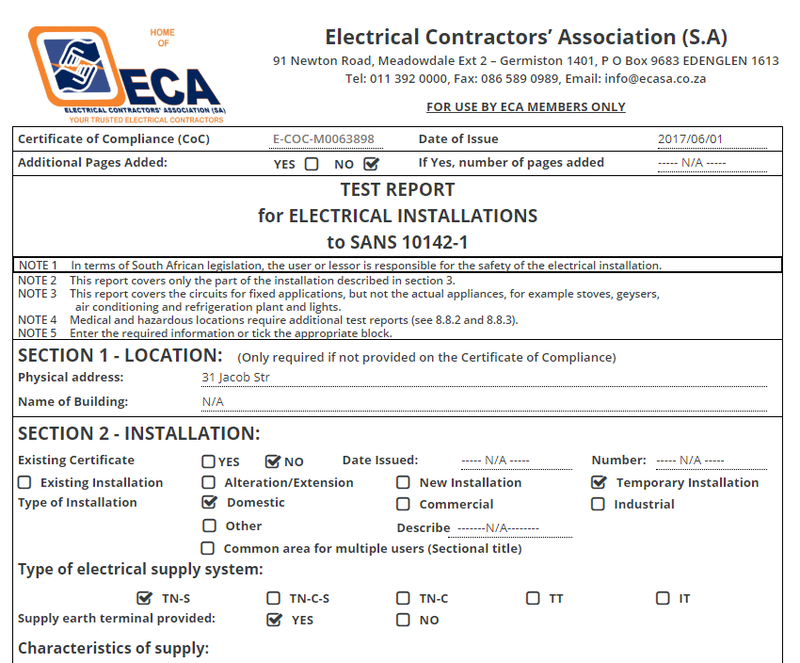 The ECA-branded CoC forms (on yellow paper) are available from our regional offices as well as from certain vendors in the various regions. 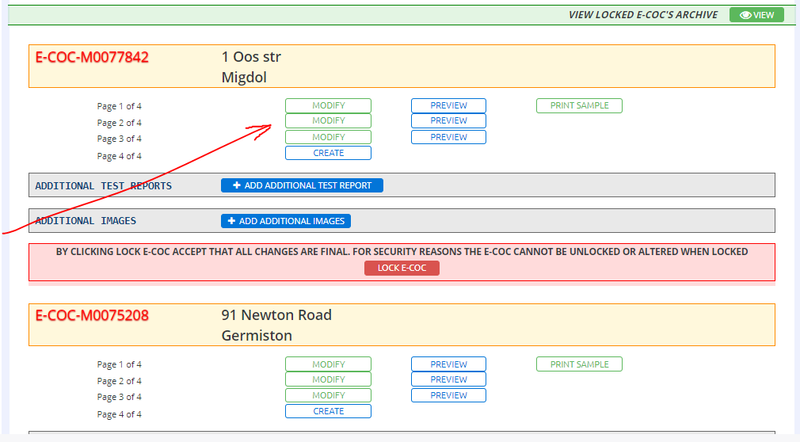 If the information that appears on your e-CoC is incorrect, it’s because your data on the ECA’s database is incorrect. 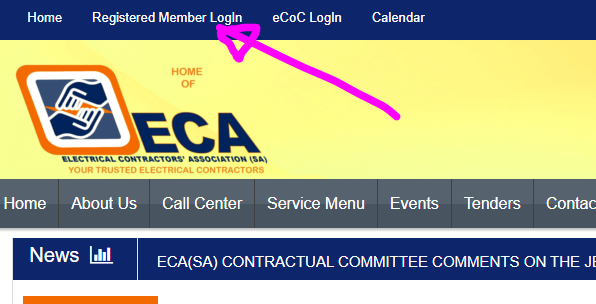 To check, go to the ECA Website http://ecasa.co.za, select ‘Registered Member Login’. 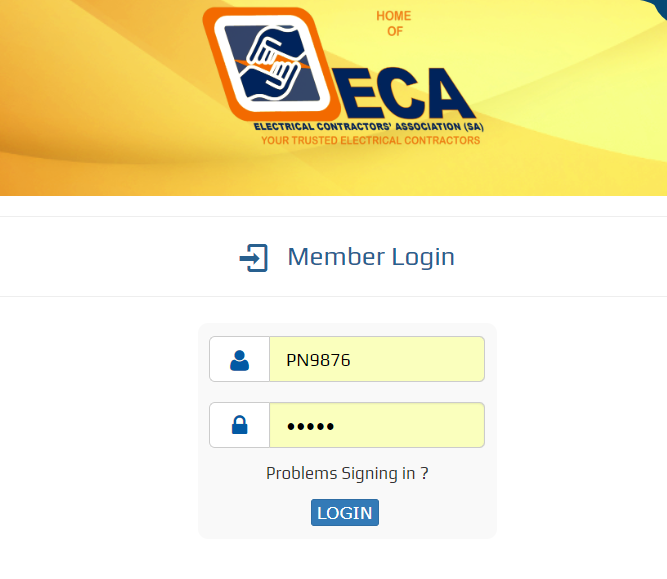 If you don’t have a username or password, contact your ECA office and they will create a username and password for you. Please be sure to have your ECA membership information handy. 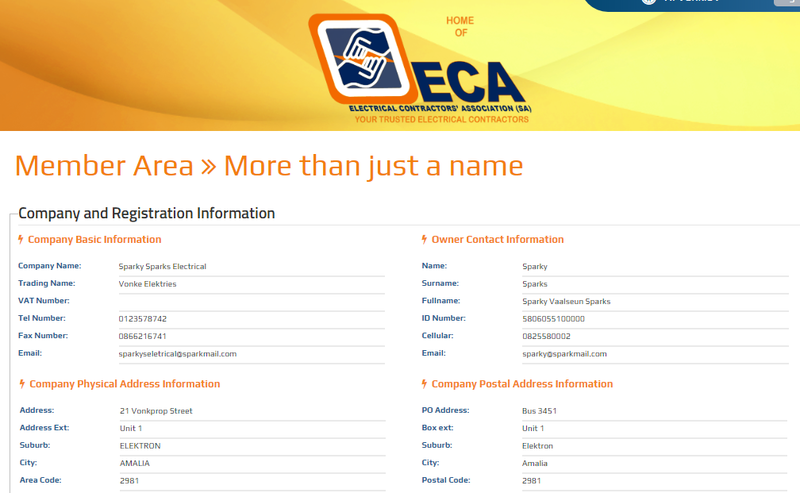 You will now be taken to the ‘Members Only’ section, select VIEW to see the information that the ECA has on its website. Print out this page, make the required corrections, highlight corrections and fax/scan to your regional ECA office to implement the correction. Note that you cannot upload corrections yourself! Any corrections made onscreen will be lost. 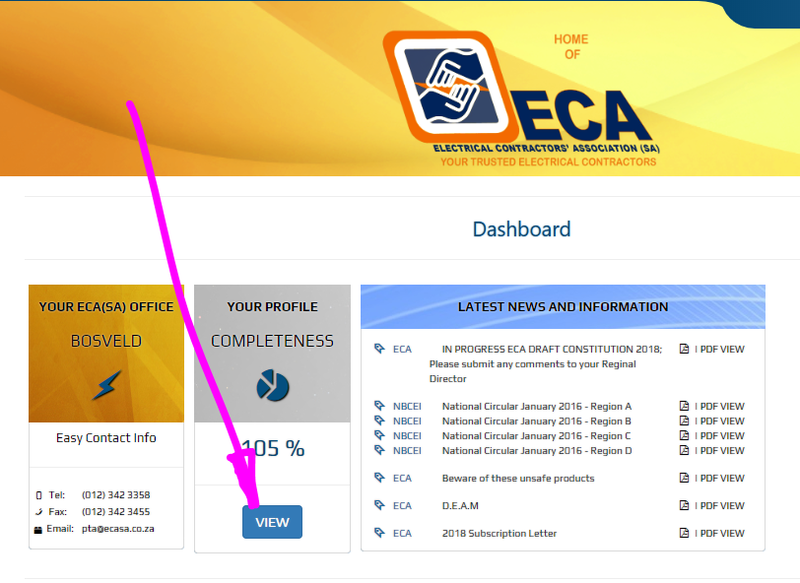 If you prefer to edit onscreen, please make a screenshot and send that to the ECA offices for implementation. If you move from this screen any changes will be lost. Please remember to point out all changes. Remember all changes have to be verified and loaded manually so please be patient. We are working on the problem!